The Major League Baseball season officially begins today. It means Spring is here (even if the Sox-Indians opener in Cleveland may get snow!) and it means that every teams starts with a clean slate, with different hopes and expectations. 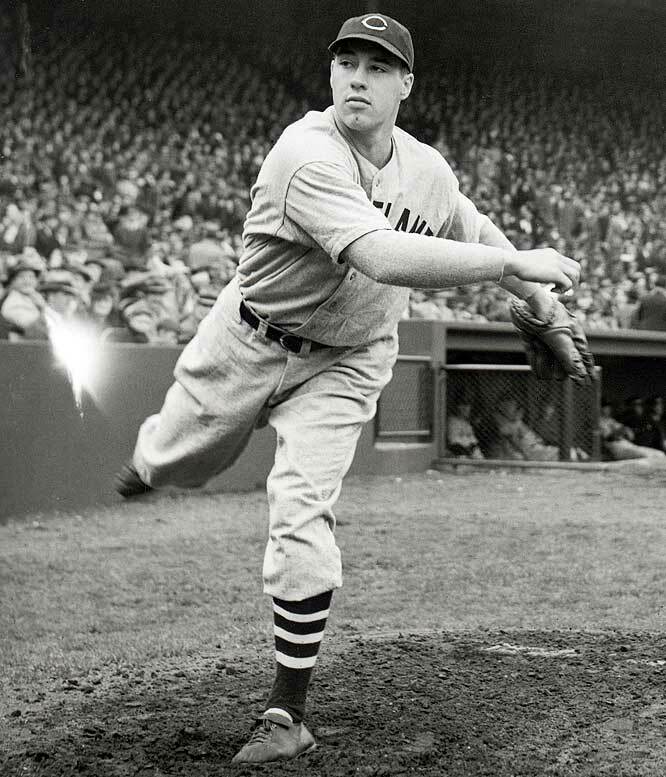 However, it WILL be the first Opening Day without America's most beloved crusty old fireballer, Rapid Robert Feller, who left us all too soon this winter. on Opening Day 1940, he no-hit my White Sox. Courtesy AP via Sports Illustrated. Stop what you're doing, and go over to GRAND DIVISIONS for a moment and read what happened in Committee today to HB0187 by our own Jeanne Richardson. It's a bill that would help transgender Tennesseans to amend their birth certificates to reflect their change of gender. Sounds simple enough, right? OK then. As Rep. Richardson was not a member of the committee, she could not move passage of the bill, which was given an actual fair hearing by chairman Matthew Hill (R-Jonesborough). Mike Turner, our Democratic Caucus Chair, moved passage of the bill. One problem: NO ONE would second the passage. NO Republicans (not surprising), but NO DEMOCRATS DID EITHER. Why not? WTF??? The other Democrats on that subcommittee are all from URBAN areas except for David Shepard of Dickson. The urban Democrats are Gary Odom and Mary Pruitt of Nashville, Joe Armstrong of Knoxville, and Joanne Favors of Chattanooga. Now, to be truthful, I am not sure which of those members attended this meeting and which did not. I am more than willing to bet, however, that ALL of them (save Shepard, of course) have received help in some form or fashion from the LGBT communities in their cities. If they couldn't be there, well, not much you can say. But if any of them WERE there and refused to second the bill, then a pox on their house (s). Right now, folks, I hate to ever call out a Democrat in this state because we are under siege. But precisely BECAUSE we are under siege is why EVERY DEMOCRAT needs to stand up for their friends, and the LGBT community is one of our biggest friends. Hell, Mike Turner represents a far more conservative district than any of the others listed above (again, except Shepard), and HE STOOD UP AND LED by moving passage of the bill. Folks, LGBT rights are HUMAN RIGHTS, and either you are for them or you aren't. I expect the GOP to vote against HUMAN RIGHTS, but I expect EVERY DEMOCRAT to support them. (Munford, Tennessee)—The Tipton County Democratic Party will hold a County Convention for Reorganization on Saturday, April 2, 2011, at 11:00 A.M. The meeting will take place at the Law Offices of Julie D. Byrd, 1486 Munford Avenue, Munford, TN 38058. We will elect the Chairperson, Vice Chairperson(s), Secretary, Treasurer for Tipton County, and discuss the agenda for 2011. This meeting will involve open discussion and opportunities for county residents to express ideas and thoughts about the future. All Democratic residents who are eligible voters of Tipton County are urged to attend. Please join us for an exciting and important event! For more information, contact Julie Byrd at (901) 840-4776. NASHVILLE (March 29, 2011) – State Rep. Craig Fitzhugh announced today that he will hold three town hall meetings to listen to constituents and share with them what is occurring in the Tennessee General Assembly. 6:00pm Thursday, April 14, 2011 Dyersburg State Community College First Citizens’ Auditorium in the CAB building. “State government affects our way of life at every level, so people need to know what’s going on. If people don’t like it or have suggestions, I need to hear that as well. I hope this meeting will allow everyone to get together, get up to speed and talk about where our state and our district are headed. I look forward to a great discussion,” said Fitzhugh. Craig Fitzhugh is the incumbent State Representative for House District 82, which encompasses all of Lauderdale, Crockett and part of Dyer Counties. For more information, contact Zak Kelley at (615) 741-1100 ext. 44189. 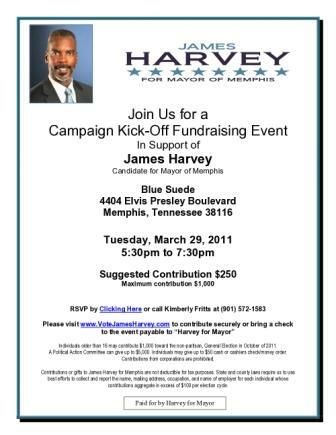 Join the James Harvey for Mayor of Memphis Campaign this Tuesday, March 29th from 5:30pm till 7:30pm for our Campaign Kickoff Fundraiser at The Blue Suede Restaurant. Please accept our special invitation by clicking here to RSVP now. The Blue Suede Restaurant is located at 4404 Elvis Presley Boulevard, Memphis, TN 38116. The Blue Suede Restaurant is across the street from Marlowe’s, near Finley Road. Please click here to RSVP by March 28th, 2011 for our Campaign Kickoff Fundraiser at The Blue Suede Restaurant to hear from James Harvey and learn more about our plan to win this race. The suggested contribution amount is $250 and maximum contribution amount at $1000. Click here to make your contribution online today. For questions please contact Kimberly Fritts at (901) 572-1583 or finance@votejamesharvey.com. Wow! Is this Really a Walter Hussmann-owned newspaper??? Sen. Lamar Alexander, the Tennessee Republican who serves his party in the U.S. Senate as caucus chairman, is one of the GOP’s many master messengers of the slick and entirely untrue propaganda about the Affordable Care Act that the right wing keeps hawking in an attempt to defeat President Obama in the 2012 election. Health care premiums are increasing, but not because the Affordable Care Act has been adopted. Rather, it’s because the ACA’s most essential levers to control health care spending, due to monolithic Republican opposition, won’t be implemented until the full bill takes effect in 2014. So today, health insurance companies are still able to raise premiums as high and as fast as they did in the bad old days before Congress — make that, the Democratic Party — had enough votes to assemble the health care reform initiative. Perhaps worse than their run-up in profits, insurers are still denying coverage to a huge percentage of Americans who try to buy individual coverage policies. BlueCross BlueShield, Tennessee’s largest insurer with 63 percent of the market, had a denial rate of 34 percent, according to a recent posting on a new government Web site. Both J.R. Lind and Andy Meek have noted today the newest blog post by former Germantown State Senator Paul Stanley. Stanley is apparently writing a book about the tryst with a former intern and subsequent extortion attempt that ended his marriage and his political career. Please take a few minutes, read his post and then come back here. It's OK, I can wait, this is the internet! I read that, and while I don't want to kick a man while he's down, this seemed really self-serving, especially when he hinted that he may have been set up. Well, you know, if you hadn't fooled around with an intern, you couldn't have been extorted, am I correct? While I was discussing this in an email conversation with a friend of mine that had also read the post, something was in the back of my mind, and then it hit me. Do you remember the final scene of Goodfellas? You know, where Henry Hill rats out his friends to save his life, and then, instead of being grateful for the chance he has been given to stay alive, complains that he misses the life of a gangster and now has to live like a normal person? THAT'S what Stanley's blog post reminds me of, that while acknowledging his mistakes ever so slightly, he's trying to get back in the life. I know he's gotta miss it now more than ever, with the Repubs having a stranglehold on Tennessee government, but Stanley comes off as little more than Henry Hill in a suit, someone who is upset more that he is out of the life than about what he has done to others. Is that too harsh? Am I not being compassionate here? Or have I perceived this correctly? UPDATE: I see that Betsy was thinking about this as well. EVEN MORE: Ross joins in the fun at VIBINC; go for the screen-cap! Go read Chris Davis' article at the Flyer about a movie about Memphis wrestling that features the great Monroe prominently, and read why he was an important figure in this city's history. It's time to think about a statue of Sputnik Monroe outside the Cannon Center, where Ellis Auditorium once stood. Mike Anderson comes home to Fayetteville!!!! When I returned home from the Germantown Democratic Club meeting (and thanks again to them for having Ross and I speak to them), I learned that longtime Razorback assistant Mike Anderson (17 years under Nolan Richardson) was leaving Missouri to come back and coach the Hogs basketball team. So, for that, you get this in celebration! Look what the Davidson County Young Democrats created! While I am way too old for YD status, go check out this website from the DCYD, it sums things up very well, I think! Come to the GDC Meeting Wednesday Night! Ross and I are speaking there! The Club will provide sandwiches, chips and soft drinks. I know of few people, if any, who give you such amazing, funny, sweet and poignant glimpses of real life as our friend who is saying goodbye to Hoots. Go read her this morning, you will be glad that you did. This is going to be about college sports, about a school we love and the one we really, really don't, at least not in Memphis. First, I believe the Tigers' year was a success, one that took the entire year for the players and coaches to figure out, even if it ended on a block of Wesley Witherspoon's shot. (Look, even if it WAS a foul, they are not going to call that in that situation unless Wesley's head had rolled with the ball). I look for EVERYONE to come back except the senior Will Coleman (yeah, Will Barton, I am talking to YOU) and I think they will be far better next year. Now, I want to talk about the other team in our fair state that lost today, the thoroughly-whipped Tennessee Volunteers, about whose 30-point loss much schadenfreude flowed today. Bruce Pearl, whom I have not liked since he got Illinois in trouble while he was an assistant elsewhere in the Big Ten, is on the hot seat due to recruiting violations, for which he sat out the first eight SEC games this season. The UT athletic director, Mike Hamilton, will be meeting with the NCAA next week to discuss those violations, as well as those of Lane Kiffin, the quasi-wonder who high-tailed it to USC after one season. Of course, Kiffin was partly to blame for USC's violations under Pete Carroll. It could very well be that Pearl will be tossed out on his ear after the meeting with the NCAA, or maybe even before. It's probable that he is guilty, but there are others who have survived far worse. The combined problems of the football and men's hoops programs have cast an unfavorable (and deservedly so) light on AD Hamilton, who in the past few years A) dumped the man who had won their first football National Championship since 1951 when he canned Philip Fulmer after the 2008 season, B) hired the aforementioned Kiffin, who offended everyone not wearing orange and C) hired Pearl, who is arguably the most successful men's basketball coach in UT history (the only one to take UT's men to the NCAAs 6 straight years). So, if the NCAA drops the hammer on UT, who takes the fall? Not Kiffin, who is at USC paying for his mistakes as a Trojan assistant that SHOULD have fallen on the departed Pete Carroll. Not Fulmer, who is still being paid off (and is no doubt laughing hysterically about this situation). That leaves two people: Pearl, and the man who hired him, Mike Hamilton. Whatever you think of Bruce Pearl (and I don't think much of him, believe me), understand that he did what he did because Hamilton turned a blind eye to it. It is HAMILTON who has allowed the culture of men's athletics to fester into the oozing sore it has become, an embarrassment to the entire state. He should go before Pearl. And if the President of UT won't sack him, maybe he should go as well. Remember, while I am a Memphian, I am also a Tennesseean for the last 39 years. This reflects poorly on the state's signature university, and heads need to roll, starting with Hamilton. As a Tennesseean, I believe it is necessary to restore the integrity of the University. Ok, smart guy, who replaces him? Well, there is someone well versed in intercollegiate athletics who understands what the athletic culture SHOULD be, who has always endeavored to have an integrity and work ethic unmatched, setting a standard for the athletes of the University. If this person were hired, the culture would change and change quickly, for no one would dare cross them. The only question is this: would she give up her current job to become athletic director? Pat Summitt should be on the Mount Rushmore of collegiate basketball coaches, up there with Phog Allen, John Wooden and Dean Smith. No human being has won more games as a head Division 1 basketball coach (women OR men), no one has more respect in the game of basketball, and no one would be better suited to change the culture that now permeates men's athletics at the University of Tennessee than Patricia Head Summitt. She is an iconic figure, someone who could right the ship and set it on a course that wins the state's admiration instead of causing our citizens to slink away from it in shame. She has courage and determination, and the respect of everyone. If she will do it, I might even become a UT fan again, which I really haven't been since Johnny Jones of Munford played football for the Vols in the early 80s. Coach Summitt, if the University comes to you, please consider it. Other than slapping Geno Auriemma with a wet fish, what have you left to prove in basketball? Your state needs you, and if they are smart, they will offer you the job. Please take it, for the sake of the state. Gov. Bill Haslam's State of the State address followed the blueprint of responsible spending and tough choices that former Gov. Phil Bredesen laid out over the previous eight years. Thanks to our previous governor's leadership, we are in better financial shape than most of the country. But the state's financial health means little to the nearly 300,000 unemployed Tennesseans who can't provide for their families, or the hundreds of thousands more who want a full-time job and can't find one. When presented with proposals to help small-business owners grow and create jobs in Tennessee, lawmakers in the majority party have dismissed them as "hokey" while claiming that government doesn't create jobs. They are more focused on printing their own money than helping put more money back into Tennesseans' pockets. Yet in Gov. Haslam's speech, he outlined $182 million in economic development funds and other investments in projects across the state, "as a stimulus for new jobs and new business investment." It appears the governor has decided, after all, that government has a role to play in creating jobs. Such an investment is a start, but more needs to be done to support our small-business owners and encourage businesses to start, relocate and grow in Tennessee. Major investments like those by Volkswagen and Hemlock required a governor who was all-in for jobs. Tennessee needs that kind of hands-on approach, now more than ever, through investments like the West Tennessee megasite, which is not funded in the governor's proposal. We believe that our rural communities should have the same opportunities as Chattanooga and Montgomery County, especially in areas with continued double-digit unemployment rates. Until we see that kind of proactive commitment from the majority party, they cannot truly say that they are working to put Tennesseans back to work. In order to attract those jobs to Tennessee, we must also increase the number of Tennesseans with college degrees. A highly trained work force is the top priority for businesses relocating to Tennessee, and that training will come largely through our higher education institutions. Unfortunately, our colleges and universities are facing even more budget cuts, and those shortfalls will be made up almost entirely through tuition increases. Increased fees are essentially a tax on our Tennessee students, many of whom have returned to school to train for a new career after losing a job. We're telling low-income students that their scholarships will remain steady, but continued tuition hikes effectively decrease their scholarships. If we're serious about job creation, we have to also be serious about giving Tennesseans the opportunity to train for those jobs. Cutting their legs out from under them with continued tuition hikes isn't the answer. The governor ended his address Monday with a call to avoid partisanship. We remain ready to work with him and the majority in the legislature to help put Tennesseans back to work. Such efforts will require an increased focus on job creation and job training, until everyone who is willing to work is able to find a job. We're not there yet — and judging by the governor's speech, we still have a lot of work to do. State Sen. Lowe Finney of Jackson is the Senate Democratic Caucus chairman. Rep. Craig Fitzhugh of Ripley is the House Democratic leader. TNDP's Vice President for East Tennessee, Brad Parish, has created THE FUTURE CAUCUS, which you can read about here. He announced this with a post at KnoxViews this morning. The gist of this is a way to bring more people into the actual party infrastructure, which I believe is a good thing. The more people you include, the better. Tennessee's Democratic Party needs new blood, and YOUNGER BLOOD, if you ask me, and this seems to be a great way to start. Braisted has more here, let me know what you think. From MSPJC: "RALLY FOR GOOD JOBS, LIVING WAGES, AND PUBLIC SERVICES"
From Madison, Wisconsin to Nashville, Tennessee: It's time to stand up!! "RALLY FOR GOOD JOBS, LIVING WAGES, AND PUBLIC SERVICES"
PLEASE ATTEND AND WEAR RED! Working Tennesseans didn't cause the economic crisis, and we shouldn't have to pay for it. Get on the bus with us to stop the attack on public service workers. WE need an economy that works for working people! Buses to the event will be leaving from Memphis early on Tuesday and returning late the same day. We are encouraging our members to get on those buses or carpool themselves to the event. Memphis Buses- meet at the IBEW Local 474 union hall located at 1870 Madison Ave. (map) You MUST reserve a space, call organizer Tom Smith at 1-877-292-3865 or email him at smith@ucw-cwa.org. Invite your friends on Facebook to the event here: http://www.facebook.com/event.php?eid=194138590606147 and follow us on twitter @midsouthpeace for rolling updates of the event. Sponsors: Tennessee State AFL-CIO, United Campus Workers - CWA Local 3865, Mid-South Peace and Justice Center, Workers Interfaith Network (WIN), Jobs with Justice of East Tennessee, CWA District 3, University of Memphis Progressive Student Alliance, Middle Tennessee Jobs with Justice, AFSCME Local 1733, Chattanooga Organized for Action, Statewide Organizing for Community eMpowerment, Knoxville-Oak Ridge Area Central Labor Council, Tennessee Citizen Action, SEIU Local 205, Tennessee Professional Firefighters Association. NEW INFORMATION: WE WILL HAVE TWO SHUTTLE BUSES AT THE TN AFL-CIO OFFICE, 1901 LINDELL AVENUE IN NASHVILLE (map) TO TAKE ANYONE TO AND FROM THE RALLY. BUSES WILL RUN FROM 10:30 A.M. TO 2:00 P.M. OR UNTIL EVERYONE IS PICKED UP. BUSES WILL DROP-OFF AND PICK-UP ON THE UNION AVENUE SIDE OF THE LEGISLATIVE PLAZA. This is your TWO WEEK NOTICE - SCDP Caucuses are at hand! Cut-off time for Registration is 10:30 a.m. I have not written much lately, and I am beginning to wonder how much I have left to write these days, but I know this much: if the transfer referendum fails, Memphis dies. It's that simple. We are walled off by Shelby County, with a shrinking tax base, left to our own devices despite the fact that we have paid for THEIR system for years, and we will die. To those who cry that this will not help the children, what do YOU suggest? Doing nothing is only a solution if you want something to die. If Memphis dies, it takes the whole region with it, and that's the saddest thing of all. Steve Mulroy explains here why you should vote yes, I have nothing more to say.